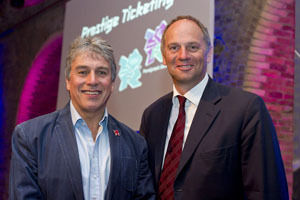 So Sir Steve Redgrave is 50 (here pictured with John Inverdale the BBC Sports presenter). He entertained a room full of Prestige Ticketing’s clients who were all looking to them to look after their clients during the Olympic weeks with top notch corporate hospitality – food and drink from the best of British suppliers! I tasted the best Devon cheddar cheese and learned it can also be a verb – to cheddar (let me link you to a respectable cheesemaking definition before you end up on Urban Dictionary). The event was held in Vinopolis where the brick tunnels were up lit with coloured lights. I decided to go with the lights for the background and light up Sir Steve and John’s face with the flash on camera bounced off the curved orange brick ceiling – the white balance control in Adobe Lightroom 3 will always bring the skin tones back to normal with a few tweaks.